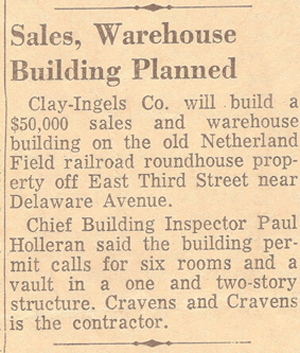 Matt Clay and Evan Ingels started a new business in 1920 with a handshake and a plan. They set their sights on becoming the leading supplier of masonry materials in the rapidly growing Lexington community. Nearly one hundred years later, Clay Ingels is known throughout central and eastern Kentucky as a major supplier of quality building products. The company, after outgrowing two locations, has expanded to include both retail and wholesale divisions, carrying not only masonry products, but also several lines of windows, doors and hardware. Now a fourth generation family owned business, Clay Ingels is home to a newly remodeled Design Center staffed by friendly professionals who believe in making every homeowner’s dreams a reality. The Design Center welcomes architects, designers and trade professionals, inviting them to utilize the displays to help their clients visualize the final product. Homeowners are encouraged to visit to get a hands-on experience enhancing the selection process. Estimating services are also provided. The company has grown to include a 90,000 square foot warehouse including a full-scale mill shop, both of which offer tremendous flexibility and efficiency. The large warehouse provides plenty of space to keep popular items in stock, available for immediate delivery. The mill shop provides customization of windows and doors, a much-needed service not available from other local suppliers. Clay Ingels has a dynamic outside sales force covering Fayette and the surrounding six central Kentucky counties aiding builders with site measurements and brick matches. The experienced sales staff is known for their commitment to bringing projects to completion on time and on budget. Quality building materials and experienced staff make Clay Ingels the building material supplier of choice for outstanding projects year after year. Copyright © 2019 Clay Ingels. All rights reserved.